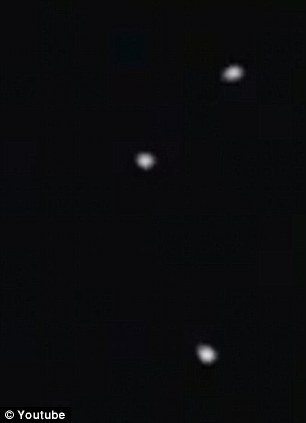 UFO Makes Surprise Appearence Above Paranormal Conference In Blackpool ? We want to believe: Is this silver dome-shaped object spotted in the sky above a paranormal conference a UFO? This is the silver dome-shaped object spotted by hundreds of UFO believers at a paranormal conference. Footage of the glowing light was captured by a film crew at the Probe International Conference in Blackpool on Sunday, prompting references to the X Files, with its slogan 'I want to believe'. Onlookers said they thought the UFO was a balloon at first but it hovered in the sky for an hour before vanishing from sight under the cover of passing clouds. This is not the first time Sam Wright, 70, from Blackpool, who runs Probe International, and his followers have seen a UFO at their conference. He said: 'We have one or two conferences a year over a weekend and they are attended very well by around 400 people or more over the two days. 'I've seen UFOs and ghosts but I don't really like to talk about it because people think you're an idiot. 'We last saw one three years ago at a conference but only about 20 people saw a silver cylindrical object zoom past us very fast. Around 200 people attended the conference, which attracts guest speakers from around the world flock to discuss crop circles, paranormal phenomenon and UFOs. 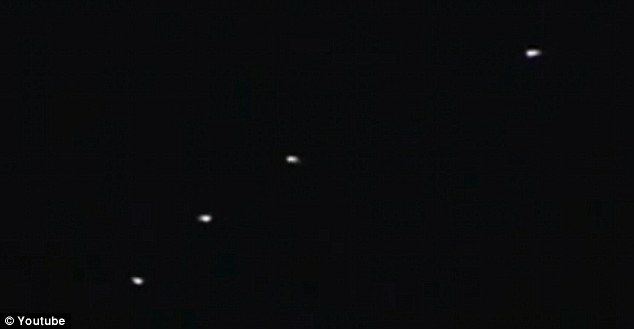 A couple spotted a mysterious flying object hovering in the night sky above their home in Eltham, south London. Charlie and Gemma were having a cigarette outside when they noticed an unidentified object hanging motionless in the distance and took pictures on their mobiles. 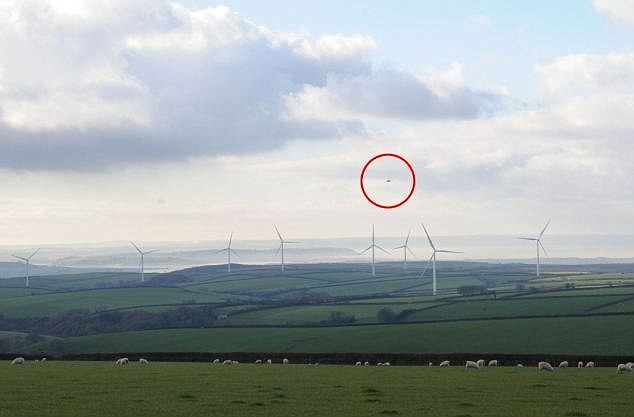 A mysterious object captured hovering above Fullabrook wind farm in Devon. Erica Whiteley reported her husband had spotted something 'unusually bright' above Fullabrook - adding: 'He was joking around saying he had seen a UFO'. The Ministry of Defence revealed that around 2,000 UFO sightings nationally have been reported between 2000 and 2009. But the government's UFO hotline - or 'X-Files desk' - was closed in 2009. Documents from The National Archives showed there were more than 600 that year, more than double the previous year and three times the usual sightings per year. 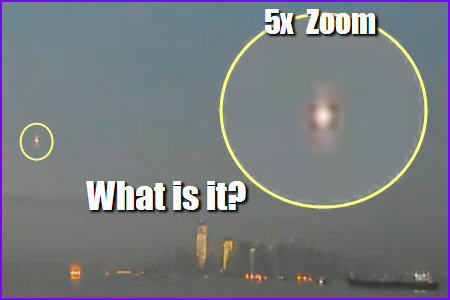 A UFO was caught on a web cam trained on lower Manhattan as it hovered in the sky before zooming out of view. What is it? 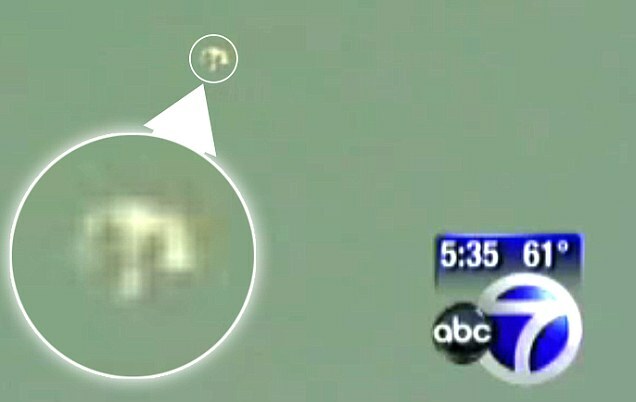 The unidentified flying object suddenly appears at the 2:00 minute mark on the 4 minute video, casting a reflection in the waters around the Battery Park section of lower NYC. It hovers, motionless, for another minute before flying off out of camera range in the westering sky. While the object may be a helicopter, the enlarged image doesn't match up with that profile. Also, the object flashes multi-colored lights, some of which are not the standard running lights for aircraft flying over the city. 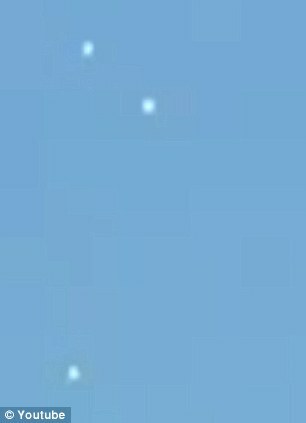 The UFO suddenly appears on what looks to be a condensed, time-lapse outtake from the webcam video and seems to change shape and color as it floats in the sky. It makes for a spooky, mysterious sighting. 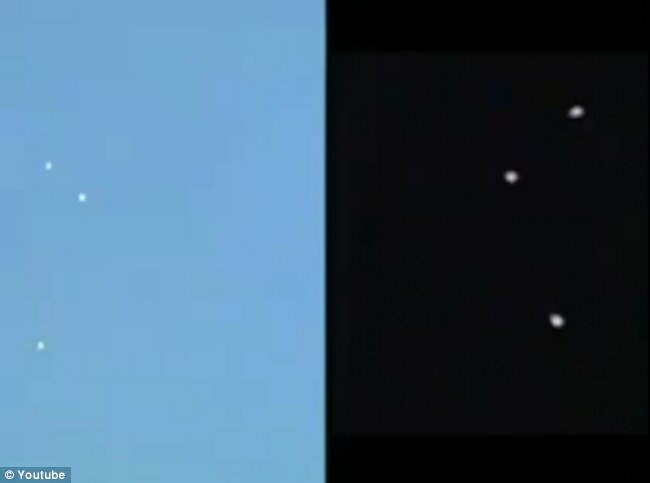 El Paso UFO Resemble New York City Balloons ? It could, of course, just be an amazing coincidence. 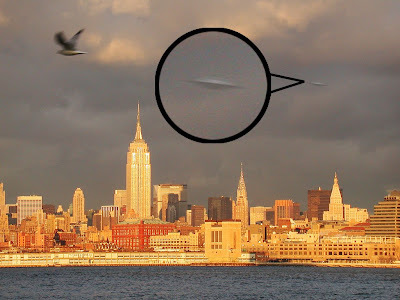 First New York was gripped by sightings of UFOs in the sky last week. The fears were quickly debunked by the claim that the 'UFOs' were actually balloons released from a nearby school. But this weekend lights forming a mirror image of the pattern seen in the sky over New York have been seen in El Paso, Texas - immediately sparking speculation that the little green men have moved down south. Witnesses in El Paso flooded local police stations and newsrooms with phone calls. Many reported seeing the same sequence of events in the night sky. First one light appeared to cascade from the heavens, separating into three, each with a tail behind it. Then they are seen solidifying into three dots forming a triangle - a triangle that was the mirror image of the three 'balloons' in New York. Next a fourth light appeared, the lights appearing to hover in the air - and then, suddenly, they all went out. Because it was dark, it seems unlikely that these lights are balloons. 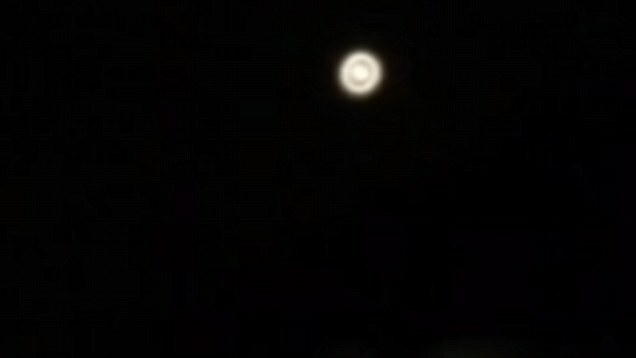 The lights were captured on video and have sparked a frenzy of speculation, especially after a local news station pointed out the simliarity between them and the sightings over New York last week. 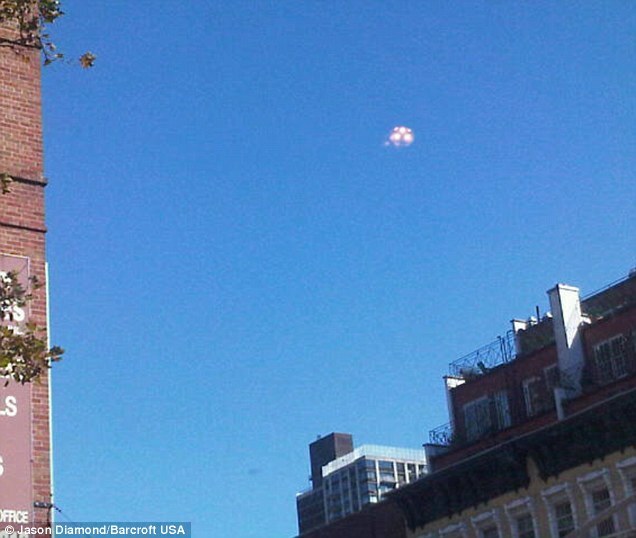 The mysterious objects hovered over the West Side of the Big Apple, causing thousands of New Yorkers to wonder what exactly they were seeing. Traffic had ground to a halt and pedestrians stopped in their tracks to look skyward at the cluster of dots hovering overhead. But those objects turned out to be nothing other than wayward party balloons from a school in Mount Vernon. Angela Freeman, headteacher of the Milestone School in Westchester said she was astonished at all the attention her decorations caused: 'It was just a freak thing. Frankly, I'm shocked by it'. The cluster of balloons were apparently inadvertently launched when a parent bought the balloons in for a celebration at the suburban school. 'The kids had an engagement party for a teacher, and a mother brought four dozen balloons, and she's coming through the door. It is very windy in Mount Vernon. Suddenly, 12 of the balloons let loose,' Freeman explained. As for the lights in El Paso this weekend, speculation is rife on the internet - and no definitive explanation has yet been given. Many have suggested a military explanation. One observer at Headhot wrote: 'They are magnesium flares on parachutes. They are used to light up battlefields. 'A single mortar is launched, then the three flares ignite and drift down on parachutes. Then they burn out and go dark. Other users suggested they were a night skydiving team practicing for an airshow. 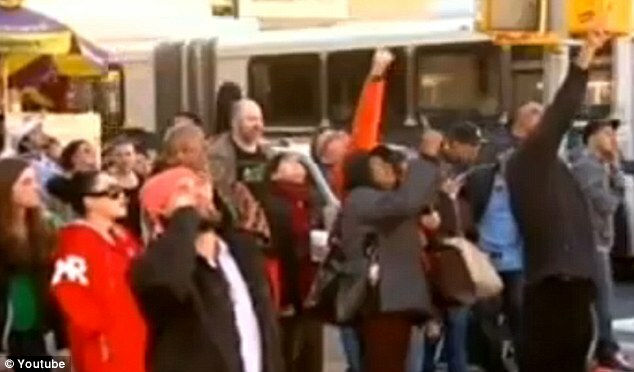 In New York, the shiny balloons which were meant for language arts teacher Andrea Crapara were released at around 1pm. The first 'UFO' sighting was just thirty minutes later. NYPD revealed that the sightings prompted several 911 calls and brought parts of the Chelsea district to a complete standstill. Veteran UFO spotters had come forward even before the school balloon explanation and were cynical that the object floating in the sky would be unexplained. Peter Davenport, director of the National UFO Reporting Center in Washington DC said at the time: 'It had the flavour of a cluster of balloons in my opinion'. Most people were sceptical that the objects were extra terrestrial life, yet remained transfixed nonetheless. Witness Daniel Calhoun, 52, said: ‘Common sense says it wasn't a UFO. Common sense says it was a plane or a balloon, but this thing stopped everyone in the street for two blocks. Some blog posts linked the sighting to a book published by a retired U.S. Air Force officer which said that October 13, the very day the sighting happened, would witness ‘a massive UFO display over the world's principal cities'. Has Chelsea become so trendy even Martians are scouting for co-ops? 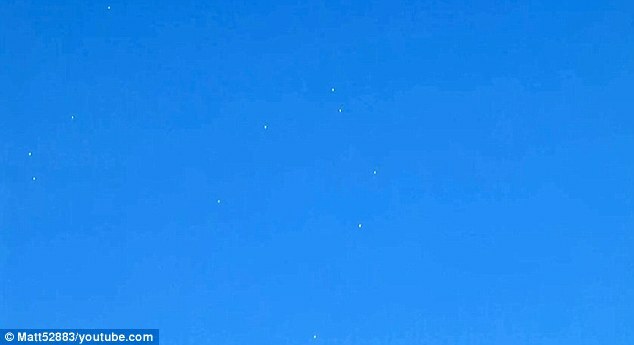 A silvery vision of a dozen balloon-like dots hovering in yesterday’s clear-blue sky over West 23rd Street had thousands speculating the mysterious objects might be UFOs. Callers began phoning the NYPD and Federal Aviation Administration at 1:30 p.m. with reports of the strange, silver objects high in the sky. "Some people saw something described as yellow with blue lights surrounding it," said FAA spokesman Jim Peters. He added that if the objects were weather balloons — as some suggested — his agency had no prior notification they’d be launched. Witness Daniel Calhoun, 52, admitted, "Common sense says it wasn’t a UFO. "Common sense says it was a plane or a balloon, but this thing stopped everyone in the street for two blocks. Any New Yorker will tell you, that alone is extraordinary." Pete Bryant, 32, said, "I saw five or six lights shining in the sky. There was no way that thing was a balloon. "There was something weird about it. Light just doesn’t reflect off balloons like that. "If Martians were to land anywhere, New York is a much better location than some backwoods town in the Midwest." Tim Powell, 28 , described the objects as "the most bizarre thing I’ve ever seen." "It looked like a jellyfish made of lights that just hovered in the sky like it wanted to be seen," he said. "I was half expecting the aliens to beam down and introduce themselves." And Richard Molina, 42, compared what he saw to the "creatures from ‘Predator.’ "
"It freaked me out. It was a real Superman moment, too," he said. "Everyone looked up in the sky. It really was an event."